Cottage Home Historic District is an intact grouping of typical worker housing from the late 19th century with a significant collection of restored wood frame vernacular housing, typical of this period in Indianapolis. This small enclave of workers' cottages is named for one of the land subdivisions of the neighborhood. Landowners began platting lots here in the 1860s, shortly after the Bellefontaine Railroad built repair shops nearby. In addition to the repair shops, residents worked in many different trades. Policemen, firemen, house painters, and mechanics lived here with their families. Later, the Indianapolis Street Railway built a trolley barn in the neighborhood, providing jobs for operators, conductors, and mechanics. Most houses in the district are cross plan or L-shaped wood frame cottages. One resident of the district, however, changed the streetscape in the Cottage Home neighborhood. Frederick Ruskaup built the brick commercial building at 713-715 Dorman in about 1875. He earned a good living from his grocery there, which provided many amenities for residents of the area. In the late 1880s, Ruskaup hired fellow German Americans Vonnegut & Bohn, who were prominent architects, to design a series of two-story shotgun doubles at 702-716 Dorman. Recent owners have restored several of the doubles, which feature hip roofs and full-width porches with lathe-turned posts. In about 1890, Ruskaup again hired Vonnegut & Bohn to design his own Queen Anne/German Renaissance Revival home at 711 Dorman. 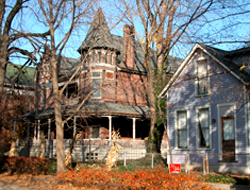 Cottage Home Historic District is located just east of downtown, in the 700 block of Dorman St. and 1100 block of East and Clair Sts. Residences are private homes. Visit the neighborhood during the Cottage Home Block Party, usually held on a Saturday in October. You can contact them by email or website. INDYGO bus line from downtown: #10 10th St., disembark at Oriental; walk south to 9th and east to Dorman.